Gypsy Gift, Honoring our Heroes, Smoky Mountain Service Dog Benefit Auction & Fundraising Challenge Comments from friends and fans! This was truly a lovely gesture and there really aren’t enough words to express how much it is appreciated. We look forward to keeping in touch with you and hope that your amazing gesture is repaid in kind. (What goes around comes around!) If we can ever assist, please do let us know. It is with overwhelming gratitude in our hearts to all of you–who voted, asked your family, friends and co-workers to vote–that we joyfully announce that Heartland has won a Lexlin Gypsy Ranch Gypsy Vanner horse! Thank you so much to everyone for your incredible support!! We are so blessed and honored to be gifted with one of these magnificent horses! 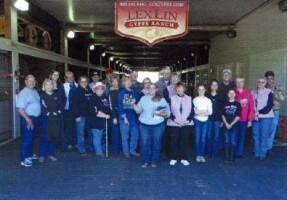 -Heartland Therapeutic Riding, Inc.
You guys are amazing! You give back so much to others by offering this event each year. The Gypsy Vanner is the most beautiful of the horse breeds as far as I’m concerned and since finding you on net and looking forward each day to some kind of message or new foul born it brightens my day!!!! I just finished reading each of the contestants for the give away and I have to say each are deserving. It’s hard to pick just one when so many out there between organizations that work year round to help our returning heroes to individuals with life long altering injuries inside and out. On a finishing note. I want to thank you for being such a Proud Giving Patriotic American! It shines through not just your words but how you and your family live each day! It shines how you handle your ranch to how you LOVE your horses! AND it shines on you on how provide something very special to those that have given their lives for this country! 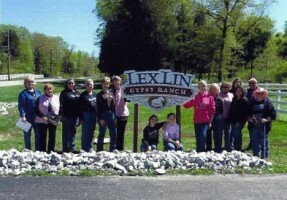 Thank you, Angel for the wonderful tour of LexLin! We appreciate your patience and kindness and invitation to come again. You did a great job and we enjoyed our day! Each year our club tries to take a trip to a horse farm. We were thrilled to find you and thoroughly enjoyed our visit to your beautiful farm and getting to know more about the Gypsy Vanner.